For those who see the KRSR (Kata Rocks Superyacht Rendezvous) as a Monaco Yacht Show held in tropical Phuket, it’s time to think again. We believe it to be Asia’s most promising and rewarding superyacht event that allows yacht owners, both actual and potential, to meet with captains, managers, builders and brokers while mixing and mingling in a relaxed fun filled environment. This years event is being celebrated by industry leaders as the definitive superyacht event in Asia, hailed as an outstanding success both in terms of prominent yachting brands on display and its relaxed and productive business setting. Over 350 invited personalities including local and international VIP guests, major trend-setters in yachting and luxury partners attended the KRSR 2018 that celebrated the superyacht lifestyle with lavish events, private gourmet dinners and luxury guest experiences. Royal Huisman and Berret-Racoupeau Design made waves with its KRSR launch in Asia. They teamed up with Camper & Nicholsons Asia to produce multihull superyacht, concepts both power and sail, that redefine luxury catamaran design from the waterline upwards. New initiatives focused on sustainability were also prominent at the KRSR 2018. SeaKeepers Society was on hand to raise local awareness of the current situation of the world’s oceans to protect, conserve, and restore where possible. Torqeedo also promoted a green ethos at the Rendezvous with its water-based electromobility, sustainability, and clean energy with its all-electric and solar powered ribs and tenders. As always, this years KRSR guest experience included lavish cocktail parties, gourmet dining and meaningful press announcements. This year the KRSR 2018 fleet featured another spectacular gathering of superyachts including Xanadu, Nymhaea, Aphrodite, Dallinghoo and Sanook. 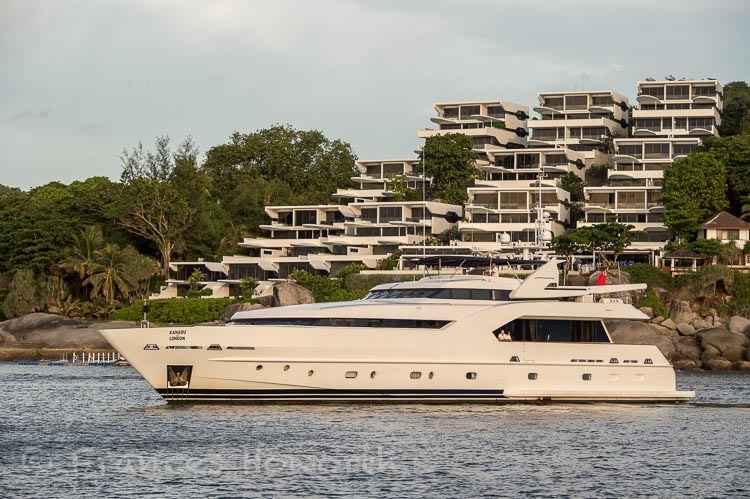 All joined in the annual KRSR superyacht fleet cruise up Phuket’s sun kissed west coast to feast on a champagne beach BBQ at The Surin Phuket. It proved hugely popular for the third consecutive year, with participants enjoying beautiful weather, epic cuisine, and water activities. The Oceanco Owners’ Dinner was very well attended by Asia’s more prominent superyacht owners and prospective buyers, while the inaugural Captain’s Dinner with Benetti and Hemisphere Monaco helped promote Southeast Asia and encourage more captains and owners to visit Phuket and the region. Other highlights include the Royal Huisman and Campers and Nicholson opening night cocktail party, Hemisphere Monaco Gin Party, Northrop & Jonson Brunch on-board Xanadu, and the Media Champagne Brunch by Benetti. The media brunch was attended by top international and regional luxury lifestyle and yachting media. The opening party was inspired by Phuket’s unique Peranakan heritage and Sino-Portuguese heritage of old Phuket Town. While the KRSR Charter Season Opening Party brought the Rendezvous to a close in grand style, celebrating the start of Phuket’s yachting season with a Mediterranean lifestyle theme enjoyed by all. It is one of the most important dates on Phuket’s maritime calendar and delivered another fantastic evening of hip entertainment and cool sounds for the VIP guests in attendance. Popular singer Eka Liu performed a lively set on a stage set up in the middle of Kata Rocks signature 35 metre infinity pool. It provided an ideal showcase for SeaJet’s high-performance state-of-the-art jet watercraft as it circled the pool during her masterful performance. The KRSR smartphone application made its debut this year and helped participants enjoy fuller and richer experiences at this year’s Rendezvous. Yachting brands were curious how the app will help shape the future of superyacht event management and technology in years to come. The success of this years KRSR 2018 reflects Infinite Luxury’s development strategy launched three years ago to place Phuket on the global superyacht map. The KRSR position as the definitive superyacht event is Asia is secure through its invitation selection process for attendees, sponsor’s events, exclusive owners and captains dinners, plus ongoing public relations and marketing initiatives organised throughout the year. It is perfectly positioned to remain a major and proactive player in the development of the industry, permanently hoisting the colours of international superyachting in Phuket, the heart of Southeast Asia. Next year the Kata Rocks Superyacht Rendezvous is scheduled for 12 to 15 December 2019.